We have the new Citroën C3 Aircross SUV available to order here at Motorparks - a new-generation SUV from the French manufacturer which is ultra-modular and habitable. This is a vehicle which also catches the eye thanks to it featuring a naturally distinctive style, while drivers are also able to get to grips with so much handy and innovative technology while behind the wheel. The new Citroën C3 Aircross SUV, the naturally distinctive SUV is available now from Motorparks Citroën and Oldham Motors Citroën. The new Citroën C3 Aircross SUV has been designed with the choice of five new-generation, efficient and economical engines, with each unit making use of advanced technology. With its Grip Control® with Hill Descent Assist feature, raised clearance and large wheels, you can also rest assured that this is a SUV that is setup to take on every type of terrain with ease. You're met with a robust design when first setting your eyes on the new Citroën C3 Aircross SUV, as well as an incredibly comfortable and spacious interior once you're behind the wheel. From its light signature to the muscular lines that sit short and high on the bonnet, there are so many striking features about the exterior design of the new C3 Aircross SUV. 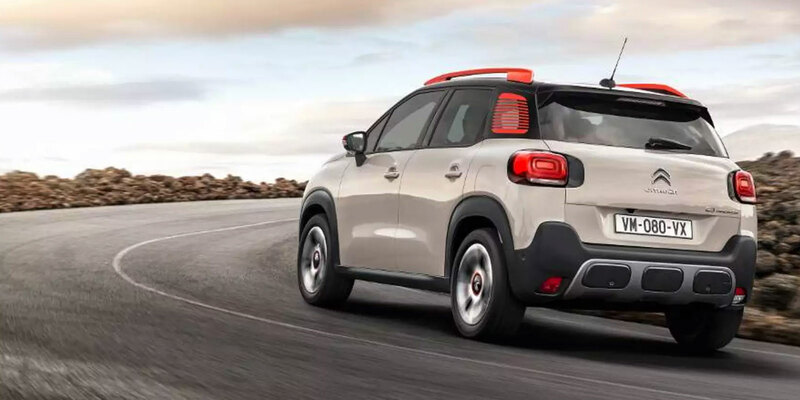 Citroën's graphic signature is also seen with the use of two-tiered lights, while its 3D-effect rear lights is a subtle nod towards both the Citroën C3 and the C-Aircross concept car. You are bound to feel comfortable while going from A to B inside the new C3 Aircross SUV, with all five seats offering generous amounts of both leg space and head room. This is on top of an incredibly spacious boot, which has a capacity of 410 litres or 520 litres by using the 2/3-1/3 rear bench. We mustn't forget to mention the car's panoramic glass roof too, as this feature helps to keep the cabin remarkably bright and airy whether the roof is closed or uncovered. The Citroën C3 Aircross SUV's cabin comes packed with plenty of state-of-the-art technology too. There's a neatly designed head-up display which will inform motorists about key driving information without them needing to ever take their eyes off the road, for example, as well as a storage compartment in the central console that's dedicated to wireless smartphone charging. So much of the C3 Aircorss SUV's technology has the safety of the driver and their passengers in mind as well. Intelligent beam headlights will increase the amount of concentration you can put into driving while travelling at night, a traffic sign recognition system will work to adapt the car's speed to the road it's travelling along, and park assist technology will take the stress out of the end of any journey. You've got a huge range of accessories to choose from when looking to make the new Citroën C3 Aircross SUV unique to you. Keep luggage stored in an orderly fashion with a boot bag, catch the eye even more with sporty wheel trims, and improve in-car entertainment with a connection harness. To discover more about how this compact SUV can be personalised and to make a general enquiry about the vehicle, contact us online today. Rather see the car in person? Pay us a visit in Greater Manchester at our Oldham Citroën dealership.